There is nothing better than spending time in your own backyard during the warmer months of the year. Whether you are catching some rays and enjoying the privacy or entertaining friends and family, relaxing in your own garden can be incredibly relaxing and therapeutic. To maximize the time that you spend out here, it is worth putting in a little work to improve how the space both looks and feels come summer. Most backyards are neglected in the winter months, and this can leave them looking drab and untidy, but the below tips will breath new life into your garden and ensure that it is the perfect area for making the most of the good weather. Much like you would in your home, the first stage involves a good spring clean of the area. There is sure to be plenty of foliage, rubbish and other unsightly objects following months of neglect, so get to work picking up and disposing of these items. Doing this will already make a huge difference to how it both looks and feels. Next, you will want to mow and feed the lawn, tidy up the edges with a trimmer and mulch the flower beds. The green areas should now look much neater, tidier and healthier. Inject color and life into your backyard with new plants and flowers. In addition to making the space much more eye-pleasing, this can also bring wildlife to your backyard which can be lovely to watch on a warm day. If you like the idea of having birds, bees, and other wildlife, you could also consider a pond or bird table. If you do not have suitable areas for plants and flowers, consider placing potted plants around the space or using hanging baskets to display flowers. Most homeowners would admit that their shed is little more than a dumping ground for most of the year, but this can be problematic during the warmer months when you need to use this space more often. Take some time to empty the shed, clean the inside and throw away what you don’t need. In addition to creating much more room for storage, it also means that it won’t become overcrowded with huge spiders that stop you from accessing the shed! The harsh winter cold, rain, and wind can take their toll on exterior surfaces, and this can make the entire garden look unappealing and neglected. Breath new life into the area with a fresh coat of paint on any fences, sheds, and gates. If you have galvanized metal outside, you may find it difficult to paint these surfaces as the layer of zinc rejects the paint. Fortunately, there is a great hidden trick to painting galvanized metal – simply apply white vinegar with a clean rag to the galvanized surface. Depending on the application, you may need to prime the surface before commencing with the painting. This handy tip can be used for any galvanized metal, including handrails, fences, furniture, staircases, etc. There is no point in having an inviting backyard if you have nowhere to enjoy the sunshine. If space permits, set up an area where you can socialize or relax with a large table and as many chairs as you will need. It is also important to wash down furniture, decking, patios and any other hard surface to create an appealing area for relaxing. If you do not get much shade outside, consider investing in a parasol for those particularly hot days (or any odd showers). You can then spend time eating, drinking and socializing with loved ones in the comfort and privacy of your own backyard. By setting this up early, you can then be the first to invite friends round and fire up the BBQ once the weather permits! You are likely to find that you will want to continue being outside even once the sun goes down when the weather is warm enough (especially if the drinks are flowing with good company!). You will not want to be sitting in the dark, so consider investing in some form of outdoor lighting. This could be electric lights, or consider an eco-friendly alternative like candles or LED lighting. It can look fantastic and create a lovely atmosphere once the sun sets for the day. A chiminea is another excellent solution that can bring light, warmth, and decoration. Extend the comfort from your home to the backyard by bringing out cushions, rugs, bean bags and anything soft so that you can fully unwind outside and make the most of the good weather. This is handy for both parties where people will not want to stand and also for flopping on the lawn with a good book on a lazy Sunday afternoon. The garden should be somewhere that you can have fun and especially if you have little ones. Kids can play with all kinds of toys in the backyard, but a few great options that everyone can enjoy includes various lawn games, sports, and a paddling pool. Having the ability to play music in the garden can be nice and especially for social occasions, but be sure to keep the volume low so that you don’t annoy the neighbors! Finally, you can put your fingerprints on the space with some personal decorative touches. There are all kinds of unique ways to decorate a garden, but a few examples include ornaments, fairy lights, streamers in trees, table decorations and an outdoor clock. The garden is the place to be in the warmer months whether you are enjoying peace and quiet or hosting a BBQ with loved ones. This is your own private bit of nature to enjoy but in order to make this an appealing space there is plenty of work to be done and particularly after the harsh winter months when the backyard is often neglected. 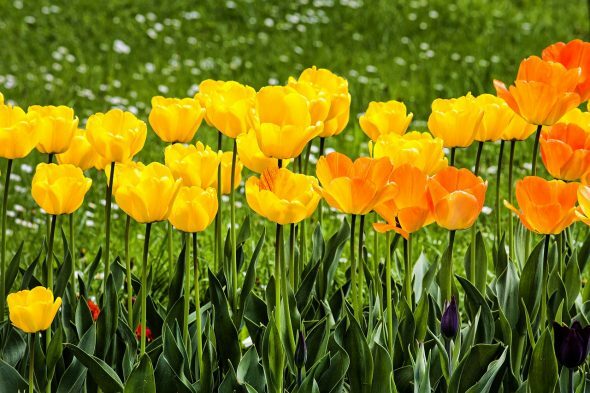 The above tips will give your garden a complete makeover and ensure that it is a beautiful, warm and welcoming space where you can make the most of the sunshine.